Trump’s new America brings with it a significant increase in intolerance and hatred. A report from the University of California's Center for the Study of Hate and Extremism has shown an increase in hate rates in recent months. We said it before: the resurgence of intolerance and hatred is a fact in the United States. A study conducted by the Center for the Study of Hate and Extremism at the California State University in San Bernardino has shown that the United States hate rate has increased by 5% since 2015, that is to say, since the beginning of the presidential campaign that declared Donald Trump as winner. Underwritten by Professor Brian Levin - even considered by the FBI as a reliable source for hate crime statistics - this study is published each November, assessing the increase in the rate of intolerance in American society. The latest report published by Levin and his team showed an "almost identical" increase in hate crimes, through two separate databases. According to the Huffington Post, the first database consisted of numbers of hate crimes reported by security agencies in 31 cities and large counties, including the 10 most important cities in the United States. The study found 2,101 hate crimes in these populations, representing an increase of almost 5% over a period of one year. In Chicago, for example, the rate increased by 20% during 2016. In New York, the increase was 24%; in Los Angeles was 15% and in Philadelphia a significant increase of up to 50% was reported. But the city with the highest increase was Washington, with a 62% increase in hate crimes. Also, 13 cities and counties showed a decrease, especially in populations where numbers have been consistently low. During 2015, hate crimes against the Muslim population increased by 67%, especially in cities where those rates had been reduced in previous periods. A second database evaluated by Levin consisted in evaluating the data offered by the states themselves, including 5 of the most populous nationwide. The report showed 3,887 hate crimes in 13 states during 2016, which represents a 5% increase in the 3,705 reported during the previous year. Levin's study has compared statistics in election years, concluding "with a slightly more than moderate degree of confidence" that the 6,245 hate crimes reported by the FBI in its Unified Crime Report in 2016 represent the highest rate since 2012, the previous election year. 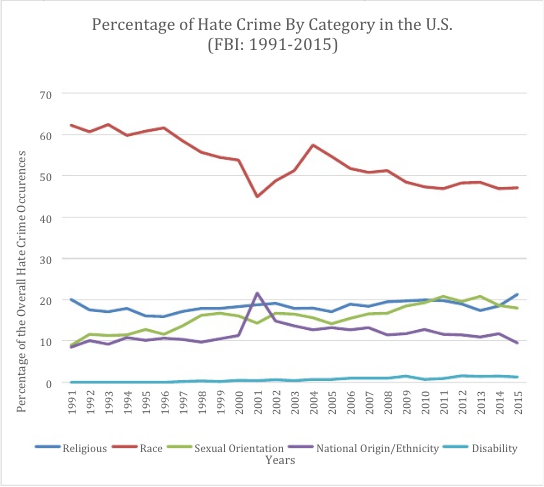 Since the 1990s, the FBI has evaluated hate crime statistics, showing a slight increase during each election year, something that Levin has attributed to "political divisions." Source: Center for the Study of Hate and Extremism. However, the increase in 2016 is alarming. According to the researcher, “what is so unusual about 2016 ― with the exception of the Midwest ― and particularly among the largest jurisdictions with the best data, was a clear and dramatic spike for the election period that was unlike anything I can recall in my professional career,” Levin said. 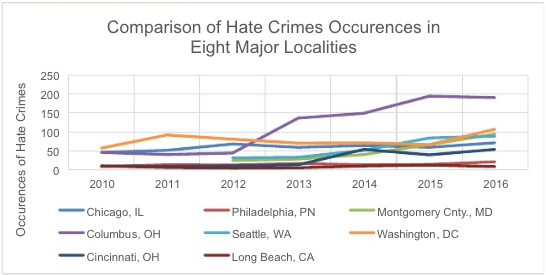 In Philadelphia, for example, seven hate crimes were reported during November 2016, when only one was reported in the previous four years, which is consistent with the Southern Poverty Law Center's hate map (SPLC) and the proliferation of intolerant groups throughout the territory. According to Levin, the increase in hate and its social organization coincides with the normalization of an aggressive political discourse, focused particularly on communities such as transgender and Muslim. But the most important thing has been the first data collected by Levin so far in 2017, which report 827 hate crimes, a 20% increase in the country's 13 largest cities compared to the same period last year. Despite the obstacles to registration and follow-up of hate crimes, the few-recorded data already paint a rather dark picture in American society. Initiatives such as the SPLC help this reality not go unnoticed: report hate here.